POPE FRANCIS HAS said that good Catholics do not have to breed “like rabbits”, defending the Church’s stance on artificial contraception and appealing to the world’s 1.2 billion Roman Catholics to practise responsible parenting. 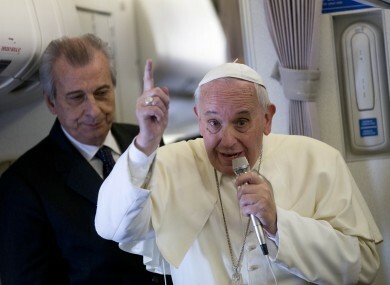 Speaking to journalists on his flight back from the Philippines, the pope said that he once asked a mother of seven children who was pregnant with her eighth if she wanted to “leave behind seven young orphans”. Francis said creating new life was “part of the sacrament of marriage” and in Manila strongly defended his predecessor Paul VI’s outlawing of artificial contraception for Catholics in 1968. Following the church’s teachings did not mean “Christians should have children one after the other”, he said. His comments came at the end of a trip to the Philippines, the Catholic Church’s Asian stronghold, which last year passed a family planning law after a 15-year battle by the Church to block state-sanctioned contraception. It was a rare loss for the Church, which has for centuries been one of the nation’s most powerful institutions and continues to count more than 80 percent of the nation’s 100 million people as Catholics. “Paul VI was worried by the growth of neo-Malthusianism” (which advocates restricting the number of children the poor can have) which tried “put a control on humanity… he was a prophet,” he said. “The key teaching of the Church is responsible parenthood. And how do we get that? By dialogue. There are marriage groups in the Church, experts and pastors,” he added. In 2013, six months after becoming pope, Francis urged the Church to drop its “obsession” with contraception, divorce, gays and abortion, in an interview signalling a dramatic shift in the Vatican’s tone. He stressed at the time that the Church’s official position had not changed, but said that it should “always keep in mind the individual”. Francis’ papacy — he is the first Jesuit pope and the first from South America — has marked a series of breaks with Vatican tradition. Email “No need for Catholics to "breed like rabbits" --- Pope Francis”. Feedback on “No need for Catholics to "breed like rabbits" --- Pope Francis”.